Say you want something savory, crispy, and fried—to start out a dinner, perhaps. Or to round out a more wholesome meal. Or to bring to a party, instead of a bag of chips (which I’ve done many times out of sheer enthusiasm for good potato chips and its place and purpose, and find no shame in). But let’s say you have time to roll up your sleeves in something a bit more involved than grabbing bodega potato chips. And it’s winter, when not too many vegetables are in season. Whether or not people in your group have vegetarian or gluten-free dietary restrictions, these squash fritters hold up on their own tasty merits—and they happen to serve both those parties. As well as this one: a couple weeks ago, I was invited to a dinner party to celebrate Nowruz, the Persian New Year’s celebration. In late March, this holiday fell at a time when the produce at the local farmers markets in the Northeast isn’t terribly colorful nor exciting. 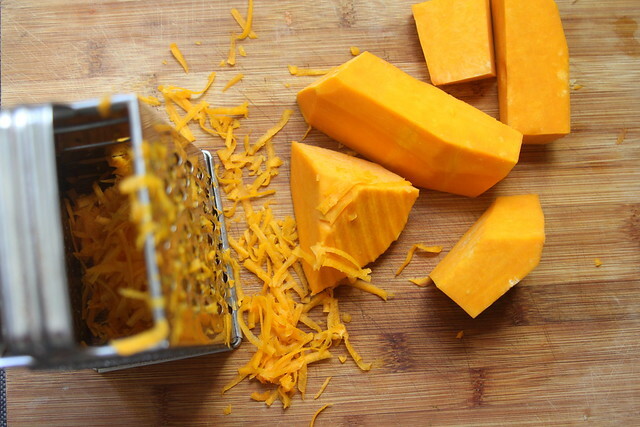 But since they hold so well in cold storage, vibrant, saffron-colored winter squash can be easily obtained all year round, in any neck of the woods. And with thanks to Louisa Shafia’s cookbook, The New Persian Kitchen, they made for the perfect party appetizer. When Nowruz was approaching, I wasted no time in opening up Louisa’s cookbook. Her recipes never do me wrong. I was so honored to learn how to make tahdig with her a few years back, and adore her vegetable-forward, easy-going approach to the food of her heritage. 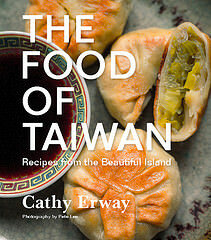 The first recipe that my eyes settled on this time around from her book was Winter Squash Fritters with Rose Petals. Hey, I’ve made some sorts of fritters involving winter squash (or other kinds of vegetables) before, I thought. And this one sounded a lot better than what I’d done. These fritters called for crushed walnuts and scallions, and chunks of feta studded throughout the shredded squash, along with ground cumin. It also called for rose petals, which I didn’t have. To leave out a titular ingredient might seem like a risk, but the sound of all the other ingredients combined in a hot, crispy fritter was just too tempting to not give it a try. So I went with it. The recipe also called for a bit of chickpea flour, which I also didn’t have. But I had a bag of coconut flour from Bob’s Red Mill and used that instead, on a hunch. This dusting of flour, I guessed, would help to bind the veggies together, along with some egg. So regardless of the different tastes, I hoped that it work do that trick. And I also imagine that regular wheat flour could also do that, while being neutral taste-wise. 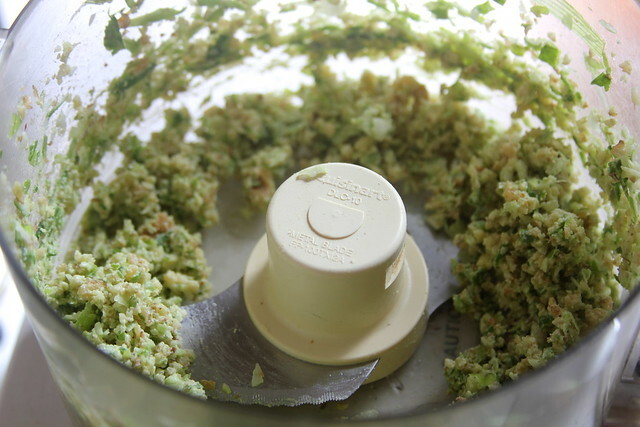 Chunks of briny feta cheese went into the mix, according to the recipe, for bursts of umami in each bite. Ground cumin gave it a pungent herbal note. I ended up making a dipping sauce from The New Persian Kitchen to bring along with them to the party—the roasted tomato and red pepper spread, which has a process similar to making a roasted salsa rojo or caponata. The squash fritters recipe called for a cooling yogurt and herb dip, which would be a nice contrast. But I thought that this might already be on the party spread at the dinner I was attending. As it turned out, there was no yogurt dip; but there was an eggplant dip from The New Persian Kitchen that I almost decided to make. As well as tahdig, lamb skewers, and roasted fish with saffron sauce. Louisa was not there (she moved to Nashville a couple years ago from NYC) but it seemed like she was there in spirit, due to the fact that at least three of the attendees, myself included, cooked from her book for this dinner party! Despite my substitutions, these fritters were incredible, and I was impressed by how malleable the recipe turned out to be. It seems like they could accommodate many more things—perhaps some chopped parsley or cilantro for color—and could be served with any sauces, or none at all. At the party, equal parts little kids and adults munched on them before dinner was served. I consider that a compliment to any food that’s offered: that it’s universally loved, let alone accepted, no matter your age, dietary restriction, culture or creed. Happy Nowruz. 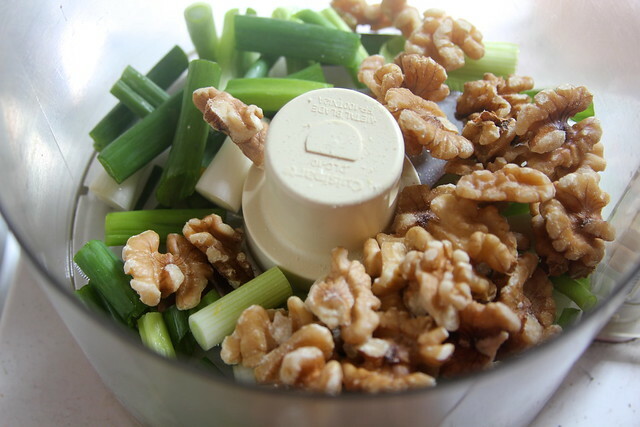 Combine the scallions and walnuts in a food processor and pulse a few times until the mixture is a coarse paste. 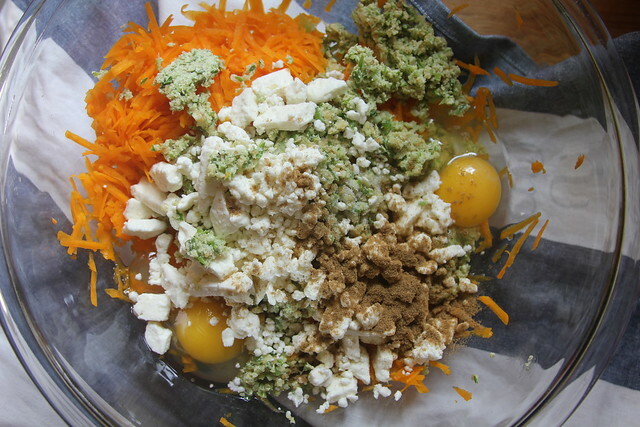 Combine in a large bowl with the remaining ingredients except the ghee/oil. Mix well to combine thoroughly. Heat the ghee or oil in a cast-iron pan or fry pan so that the pool of ghee or oil covers the entire pan by about 1/2″. 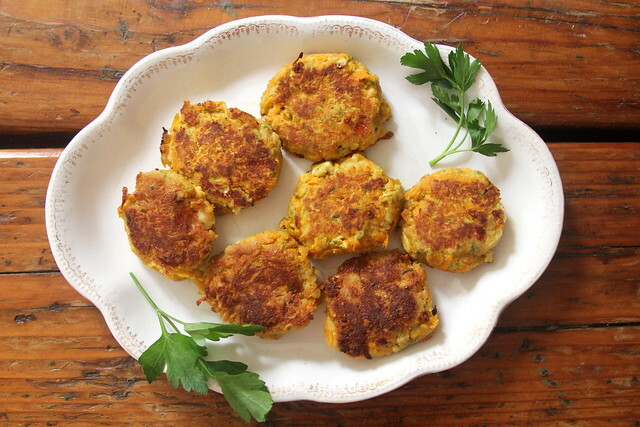 Form the squash mixture into fritters with your hands (I made them about the size of slider hamburger patties). Place carefully into the hot oil with about one inch in between each fritter. Brown the bottom sides about 3 minutes, or until golden-brown (reduce heat if they are browning too quickly). Flip each one carefully to brown the opposite sides. Once each side is golden-brown and crisp, transfer to paper towels. Serve immediately. Five brownie points: It tastes, looks, and satisfies like a delightful crispy appetizer. But it’s also full of beta-carotene from that winter squash, its main component, and protein from all those walnuts. 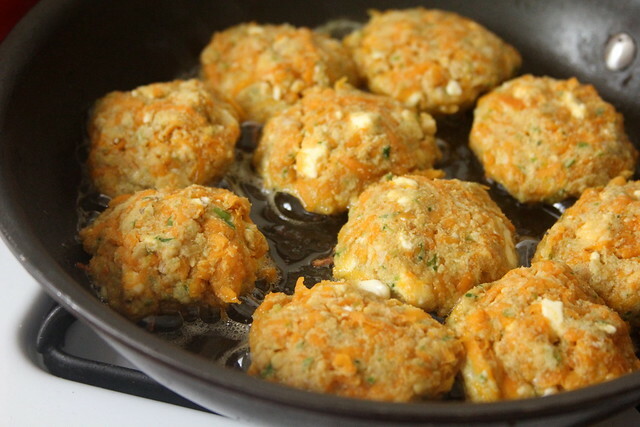 It’s cooked with a bit of dairy fat and contains that as well, from the feta, but you could always leave those things out to make these fritters vegan, and leaner. 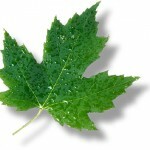 Seven maple leaves: I salute this recipe for using mostly pantry staples along with a fresh vegetable that is very storage-hardy. To lose some carbon footprint, you could again leave out the dairy (and perhaps add in some more herbs and spices), but the essence of this dish is winter squash, which is cheap, economical, easy to grow in your backyard and easy to forage in your local foodshed. Thank you so much for sharing the recipe! Gotta try it for today dinner. It sounds great.